When he registered for the draft on June 6, 1917, Red May was already married, the father of a baby girl, and working at the Kincaid Foundry in Christian County. He also played football for Coach Grover C. Hoover’s famous Taylorville Independents semi-pro team. When the A.E.Staley Company formed its first semi-pro football team in 1919, Walter and his older brother, Chester “Baldy” May, tried out and made the team. In October the Decatur Herald predicted, “The two May brothers, of Taylorville, will play side by side at left guard and left tackle. Brotherly love is expected to make this side of the line invulnerable. ” That year the Staleys outscored their seven Central Illinois opponents 294-10 even though the May boys apparently sat out the game against their old hometown. 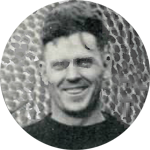 May played left guard for the team and was a substitute in the Staley’s first two home victories against the Moline Tractors and the Kewanee Walworths. On November 25, 1920 he got in the close Thanksgiving Day game against the Chicago Tigers at Cubs Park. Because this was an American Professional Football Association sanctioned game, May is credited with playing in one game of the now National Football League. In addition to his Staley salary, Red received a $40.00 bonus as the end of the season. He did not participate on the 1921 Staley team and did not move to Chicago with them in October of that year. Walter continued for a while with the Staley Company and then moved around and for a while served as a Taylorville police officer. His first son, Walter C. “Buddy” May, died at age six in 1930. The family later moved to Peoria, IL where Red worked for the Highway Trailer Company. Walter May died on November 8, 1934 from the possible effects of a mastoid infection. A few days later he was laid to rest next to “Buddy” at the Oak Hill Cemetery in Taylorville. On December 13 of that year his second son, Charles May was born. Charlie went on to also play football for Taylorville High School and then Millikin University before having an engineering career with Caterpillar. Responding to a letter from Charlie, on April 10, 1957, Chicago Bears owner George Halas wrote: “I remember your Father quite well and am certainly sorry that you did not know him because he was a fine person and a Dad of whom you could be proud. I am glad that your Mother kept the scrapbook from his playing days because the football players in those days had to be rough and ready – it was not the day of the “two platoon” system. ” Charlie’s mother also saved Red’s now century-old leather football “helmet.” The one that he wore in 1920 during practices against Trafton and Halas and Sternaman and Chamberlin and Conzelman. In 2016 Charles May donated that helmet to the football wing of the A.E. Staley Museum in Decatur.